TFI Envision receives Platinum AVA Digital Award | TFI Envision, Inc.
Arlington, TX — The AVA Digital Awards is an international competition that recognizes excellence by creative professionals responsible for the planning, concept, direction, design and production of digital communication. The AVA Digital Awards include work ranging from audio and video productions- to websites that present interactive components such as video, animation, blogs, and podcasts- to interactive social media sites- to other forms of user-generated communication. TFI Envision, Inc. is pleased to announce that it has won a Platinum award for BBB Industries, LLC “OE Overhaul”:30 second TV Spot Series. 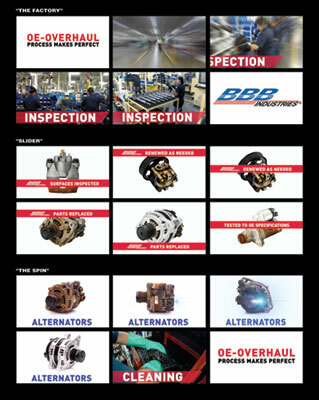 BBB Industries – a leading remanufacturer of automotive aftermarket parts – selected TFI Envision to develop a unique campaign to address misconceptions within the industry regarding remanufactured parts. The automotive aftermarket remanufacturing industry has had to overcome a perception that remanufactured parts are of inferior quality. As a result, the industry focuses on only showing completely remanufactured parts in marketing and promotional materials. TFI Envision’s research process discovered that everyone in the industry knows a remanufactured part starts out as “worn out” part. So rather than following the industry marketing trend of only showing a finished part, TFI Envision decided to embrace the worn Original Equipment (OE) part and developed: BBB Industries – OE Overhaul*. * OE is an industry term for Original Equipment manufacturer parts.